Arts of Point Richmond in collaboration with Kaleidoscope Coffee are sponsoring art exhibit featuring artwork by Sharon Goods. 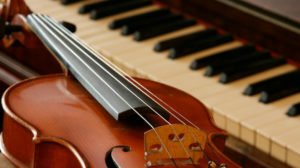 Reception, open to the public, is Saturday, March 9, 4-6p. 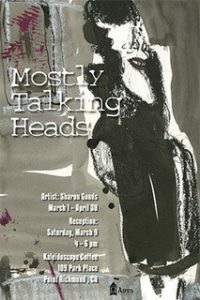 Titled “Mostly Talking Heads”, the exhibit includes images and text. Sharon describes it as “graphic novelesque. Favorite quotes, collected over the years, have landed with images of slightly offbeat characters to depict the humor, angst, absurdity, and vulnerability of the human drama. JazzPack brings life to the American standards and moderns of Jazz. 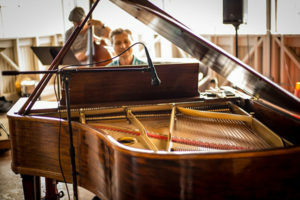 Anchored by Graham Leggett on keys, Dan Keller on bass, and Dave Strong on drums, JazzPack showcases guest soloists from around the Bay Area. 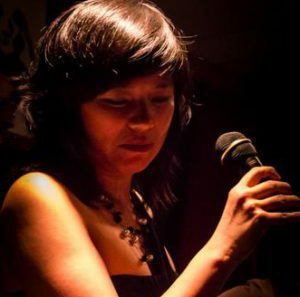 Wonderful jazz vocalist, Emy will be singing jazz standards and Brazilian tunes with pianist Ben Stolorow. Kit Eakle is a local favorite. Fantasic jazz viloinist! 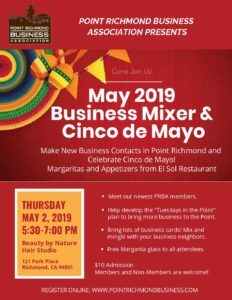 Come celebrate Cinco de Mayo and make new business contacts at our May business mixer. We’ll be serving drinks and appetizers. We’ll also be planning the “Tuesdays in the Point” initiative and would welcome your involvement. The Mocha Moms of Contra Costa County – West are offering all moms, grandmothers and caregivers an evening of shopping, pampering, tasty treats and wine tasting at the 7th Annual National Moms Nite Out. Admission is only $5 ($10 at the door), so the event is truly a treat for all those who attend. So mark your calendars, get the babysitter ready, and get your tickets now because you deserve a night out! Mix and mingle with friends and meet new ones! Did we mention the FREE wine tasting? Goodie bags include product samples from our sponsors. From beauty products to food for healthy living, the Goodie Bags are included with your admission. There is a limited quantity available so buy your tickets today to ensure we have one for you! Raffle Prizes include gift cards, jewelry, nail products, books, tote bags, gift baskets and more! More items are arriving every day so set aside some funds to purchase a few tickets to win an awesome prize! Tickets are $1 each or 6 for $5. Raffle drawings will be held every half hour. Must be present to win. So what are you waiting for? Get your tickets now! 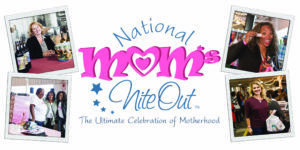 For more information, visit www.momsnite.org. If I purchase a ticket, am I guranteed a goodie bag? While we would love to provide every attendee with a goodie bag, we have a limited amount available. The goodie bags are available to the first 100 ticket holders, so order your tickets today! If tickets are sold out online, can I still purchase one at the door? Yes! Tickets at the door are $10, so purchase your tickets online as early as possible and save $5. Yes, only adults aged 21 and over may attend the event. This is a night out for moms so please leave the kids at home! Yes. Please update your information before the day of the event so that everything matches and have the new ticketholder bring a copy of the ticket with their name on it. Yes, or you can show your ticket on your phone. No. Please update your information before the day of the event so that everything matches. Please email nmno@momsnite.org for more information. Join us in 2019 for our famous Pancake Breakfasts and help celebrate our 75th Anniversary! 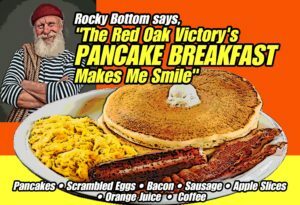 Help get the Red Oak Victory underway and enjoy home cooked scrambled eggs, sausage, bacon and of course pancakes! Beverages include orange juice and coffee; mimosas are available for an extra fee. Your ticket helps us continue the restoration work on the Red Oak Victory. We lit off her engines last year and now we need to complete the work necessary to get the ship underway and taking passengers on the San Francisco Bay. Your breakfast and donation to the ship is only $12 for adults and $5 for children 8 and under. August 11 Dress up like 1944 and celebrate the ship’s 75th Anniversary! October 13 Fleet Week- see the Blue Angels and other airshow planes from the deck of the ship! Breakfast starts at 9:00 AM and ends at 12:30 PM. Arrive early to reserve your seat with the best view of the SF Bay! This is the only breakfast in the Bay Area cooked on a bona fide 1944 Diesel-powered stove (no worries, you can’t taste it in your food), in the original ship’s galley. After breakfast, enjoy a tour of the ship or just sit, chat with new friends, and enjoy beautiful views of the San Francisco Bay Area. 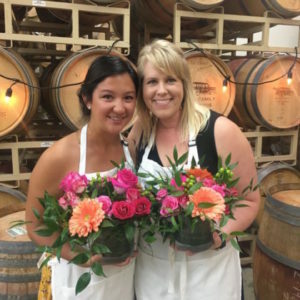 Unwind and experience a beautiful, flower-filled event, and bring home a beautiful arrangement of your own creation!